May we take this opportunity to sincerely thank you for your services - Friday last in Cambridge. All concerned, in particular, the family and mourners was immensely grateful for your attention to detail also the note perfect piping. We especially wish to thank you, for your efficiency and professionalism throughout, from our initial contact, until the conclusion of the funeral. We at T. Cribb & Sons, would have no hesitation in recommending your services to another Client or fellow Funeral Director. I can't thank you enough, you were definitely the right choice for us today and were truly professional, mum would have loved it. So many people at the wake mentioned how good you were and that we did our mum proud. I think our choice of music was exactly right. Thank you once again, I won't hesitate to recommend you to anyone. Thank you again for everything today. We appreciate it very much. Apologies I didn't get a chance to thank you in person. It was perfect. You were fab. Exactly what was needed and people from the funerals before and after enjoyed you too. You looked and sounded amazing. Thank you very much for completing our wedding day yesterday. 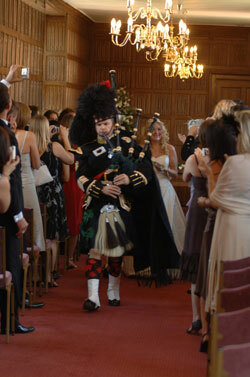 No Scottish wedding is complete without a bag piper. 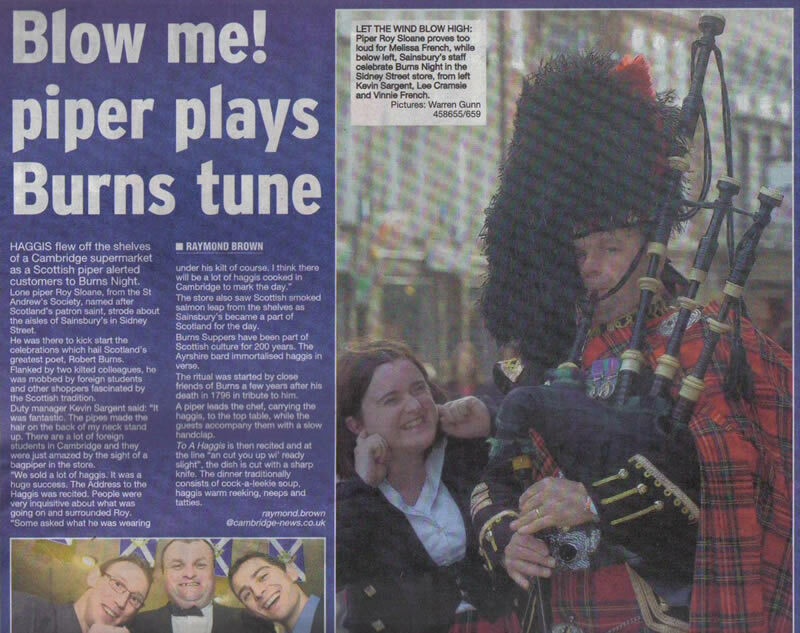 You're obviously an extremely talented piper, all our guests commented on how they enjoyed listening to you play. Im so sorry not to have had chance to thank you in person yesterday, but please accept our heartfelt thanks for your beautiful playing yesterday. My dad would have been so pleased to have heard it, and in a way, I hope he did. You are clearly a hugely talented piper, I listened to many version on You-Tube in the weeks before the funeral in the hope that I would get used to it and not cry on the day. Yours was a league above any of the others, and of course, my preparation was of no use! Everybody was most impressed and you certainly assisted with sending father in law off as best we could. 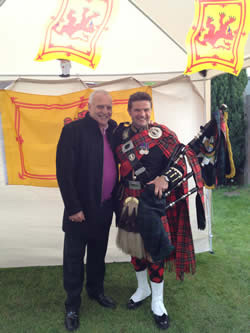 I just wish I had a bit of Scottish blood in me so I can have the same send off! Kind regards and thank you. Thank you for such an excellent performance - and it was really interesting for us all to hear about the pipes, your uniform and the regiment. All of our guests said how much they enjoyed the music and hearing from you. We all learnt quite a bit. Thanks so much, it was great - we had a fab night and raised some cash too! Thank you for playing yesterday, it was so beautiful and a lot of people commented on how lovely you played and such an amazing send off for Nancy. We were delighted that you could play for her. 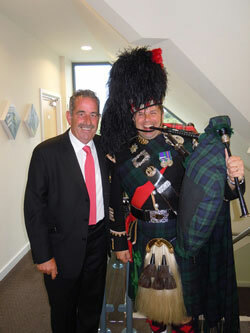 Thank you so much for playing for us on Thursday, it was great to get a Scottish touch to the day, we loved it! Everyone really enjoyed it, some people there hadn't seen a bagpiper play before so it was really good to have you there. I'd like to give a massive thank you to you Roy for your attendance at our wedding on 07/07/17, you were fantastic and a wonderful surprise for our guests and brought many a happy tear to the eye. 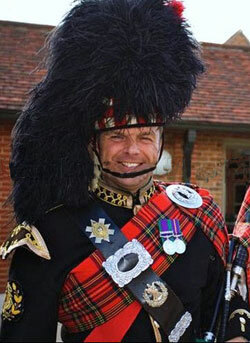 It was an amazing experience to hear you play the Bagpipes and an honour to see you in your Royal Highland Regiment dress, a truly memorable moment for my husband and I which we will cherish. Thank you so much for being there, You were so professional and looked amazing, the sound of Scotland came from you to create the perfect atmosphere to say goodbye to Dad. We could not ask for anything better. Just wanted to say many thanks for playing at my wife Sheila's 60th Birthday Party at Eastree on Saturday. It was brilliant! Very impressed. Booked to play after my wedding ceremony. Professional and friendly, and was happy to cooperate with my specific arrangements and wedding photos (the booking was a surprise for the bride and guests). Absolutely fantastic - and highly recommended! Roy you were FANTASTIC! A real highlight and surprise for our guests and you looked superb. 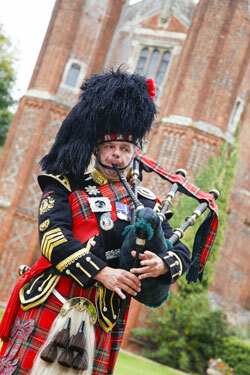 I just wanted to say what an amazing job once again from yourself we were very pleased with the bagpipes. You were superb,thank you for making my new wife's day, she was bowled over by it. I will recommend you to everyone. Thank you so much for playing at Mum's funeral on Monday at such short notice, It meant so much to the family. As I said, after you played at her 90th birthday she said "I want Roy to play at my funeral". I'm sure she was looking down on you and enjoying your piping. Thank you again for making a sad day so memorable. Many thanks for what you done yesterday, there aren't enough words of praise and thanks to say! I have attached a photo from yesterday with yourself and the happy couple, again, I cannot thank you enough, everyone was complimentary about your performance. To see people stop and watch as you led the couple along the road will be with me forever. Thank you very much for playing such a big part in our day and doing a fantastic job! We really appreciate all that you did and if we are having any other celebrations that call for a piper, you'll be a man! 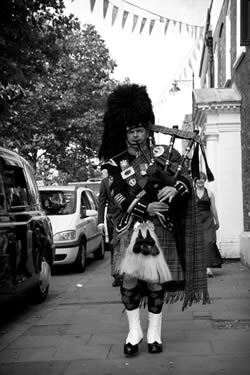 My uncle Don would have been so so proud and no-doubt would have been marching by your side during your funeral precession bagpipe play-down to the crematorium. My dad James(Jim) was so gratefull and honoured for your excellent service Mr Sloane. Again Many Many thanks from all the Wilson family for your Professional service & time(That Will Never Be Forgotten)!! Kind Regards-Uncle Dons (nephew) Andy Wilson. Hi, My sister, brother and I all thought your were amazing. Two people that were there on the day play the pipes (or did when they were younger) also thought you were great. it was great to have you and you were a massive hit. 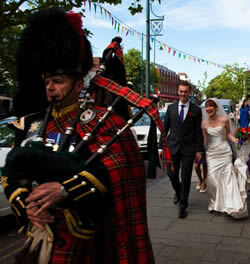 We are now thinking of all the other occasions we will need a piper for! 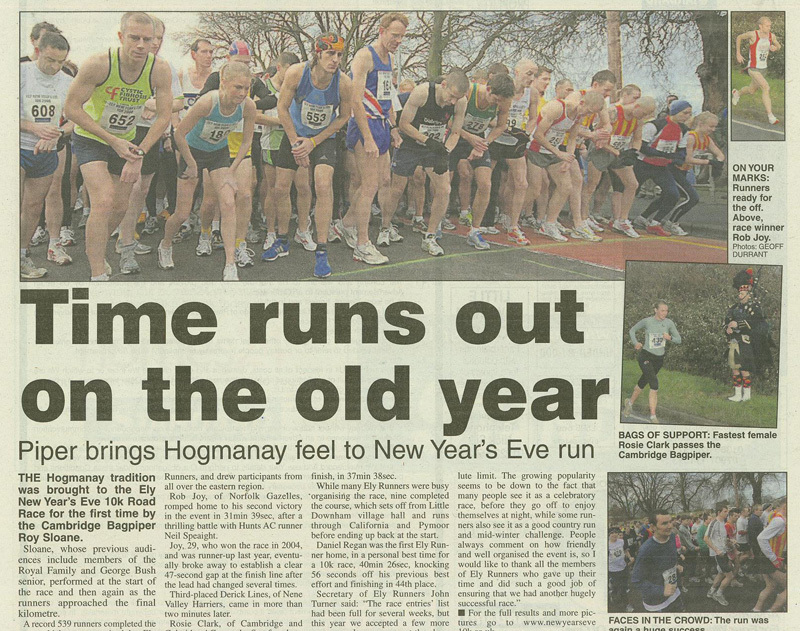 I ran the Ely 10k on New Year's Eve - please do let Roy know how encouraging it was to hear the bagpipes playing as I came up the hill around the 8-9k mark! I managed to give him a wave of thanks between gasps for air but of course he wouldn't know me from Adam! It was the first time I've entered and was a great seasonal atmosphere. Just a quick email to say a thousand 'thanks' for playing at the Kershaw Christmas Lunch at Hallmark Hotel in Bar Hill on Wednesday 23rd December - it certainly made the event really special as our theme was all about Scotland. Everyone enjoyed listening to you playing the feedback was very positive, as I'm sure you are aware by the photographs people wanted with you - and you looked magnificent in the full regalia, I can't thank you enough and I thought you were awesome. The amount we raised for the Neonatal Intensive Care Unit at the Rosie Hospital in Cambridge was £4,000 through tickets sold from our raffle which took place on the same day. Thanks so much - it was perfect! you were absolutely brilliant so thank you! Everyone who was there after said how well you played and lovely it was. Added a really nice touch. So thank you. 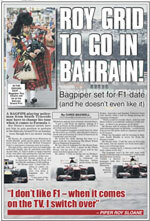 If I hear of anyone who needs a bagpiper I will definitely send them your way! Roy piped at my wedding in October 2015, perfect arrival, exactly on time. I was getting ready at the time, make up and hair done etc and the hotel bedroom window was open, I heard him for the first time, I cried, so much! He sounded beautiful and I was so proud that guests were arriving to this lovely sound. 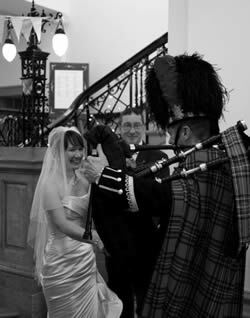 He piped me into the ceremony room ( highland cathedral ) and into the wedding breakfast, he really did do an absolutely brilliant job. 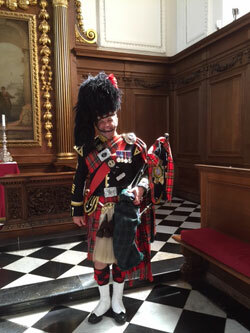 All my guests were talking about him for weeks afterwards ( which was lovely ) he was a very friendly Bagpiper and made us feel at ease whenever we were around him. Please book Roy, he's brilliant at what he does. Plus, he is very reasonably priced! Thankyou so much for yesterday Roy, you were incredible. Sorry for not seeing you off yesterday it all become a bit of a blur. Will definitely recommend you! Thank you so much for playing at Sally's funeral on Friday, it made a sad occasion a particularly special and memorable one. There were many comments about how amazing you were and how much Sally would have loved it. I was so worried about the whole thing as you appeared too good to be true, but you were exactly as I had hoped and I would not hesitate in recommending you to anyone. 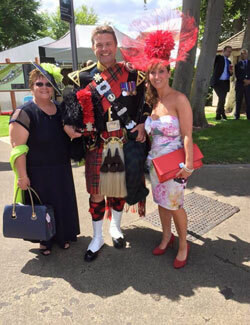 One of the highlights of the day was hearing the bagpipes in the distance & getting louder as Lee approached the ceremony room & Lee said she became very emotional as you started piping Flower O� Scotland. Leading us out to the terrace was a special moment as well, we couldn�t have asked for anything more! Thanks you so much for playing a major part in our day & I hope it helps you receive more bookings. 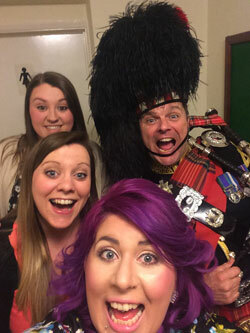 thank you so much for coming you were absolutely brilliant and all the guest loved the bagpiper. I'm sorry we could not say goodbye but the pleasure was always ours. We will send you some photographs once we have them. I apologise for the delay in thanking you but I have been away until today. 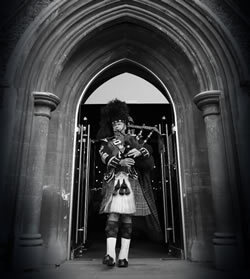 You played at my husband�s funeral at St Philip Howard Church in Cambridge. I am sorry I did not get a chance to speak to you but I wanted to thank you for making the funeral so special. As soon as I heard you play I could not hold back the tears. 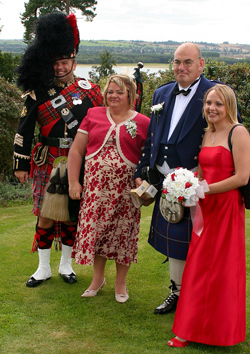 My family all being Scottish love the bagpipes and you played so brilliantly leaving us with such beautiful memories. It was perfect just what we had hoped for therefore we have no hesitation in recommending you for any occasion. I hope to meet you in happier times. We woud like to say a massive thank you, you did a fantastic job. Everyone was very comlimentary, and you certainly set the scene. Thank you for opening and closing the Service at Seven Hills Crematorium for Mrs Banham yesterday. Everyone appreciated it - the Service soared / flew on its wings. Keep up the good, true and beautiful work. You were great! My Dad said it was the cherry on the cake. This is just a quick note to say thank you for being so patient and playing so beautifully for our wedding. Adam and his family were very surprised and touched and everyone said that you played wonderfully. Thank you so much for being part of our fantastic day - I'll send you some photos once they come through. Thankyou so much, you was amazing and even got me crying (in a good way). Everyone loved you. Thank you so much for yesterday. Absolutely brilliant you made the service even more special. Thank you for your email and we were very pleased with your professionalism throughout the funeral. Everything went well and the Seaforth tunes were good to hear, the Barren Rocks of Aden particularly appropriate on such a hot, sunny day. It was good too, to see my father's pipe banner and I hope that we added an unusual touch to the Suffolk countryside. My father would have very much approved. We would just like to express our sincere thanks from our whole family for your service yesterday, you helped make our mums day complete. Just a short message to say thank you for piping at my dads funeral yesterday he would have loved it also a big thank you for playing the Inverness gathering at short notice that meant a lot to me. You were brilliant. 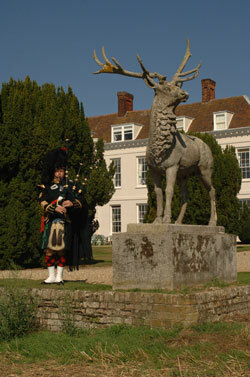 Many thanks for piping at the Wedding. It added an extra something to a wonderful day. Kaylee could hear the pipes from her house - she loved them. Thank you again. I can't thank you enough for making our day. Karen was absolutely blown away when she realised you were there to meet her. The choice of music was on point and you were right in the selection, thanks. Thank you so much for today. Dad cant stop talking about it you made his day. Thank you for making our day a very special day. It was great having you there and everyone enjoyed your music. We are just waiting for the video which I'm sure Dave from Ride out Films captured you playing . Thank you so much and we will forward you any video material of your music soon . Hi. Just wanted to say thank you for yesterday. Sorry I didn't get a chance to thank you personally but having you playing so beautifully just seem to make it a little more special. Once again a big thank you. You were great, and I wanted to thank you for making a sad day rememberable. So sorry I haven't written before but there has been so much to do this week I am still catching up with myself. I am so glad we managed to book you to play at mum's funeral. Everyone remarked about how much she would have loved it and it was such a dignified and touching way to show our love and respect. She was able to be a true Scot to the very last. On behalf of the family, thank you very much. Thank you for being a part of our special day, everyone loved the idea and enjoy your playing. 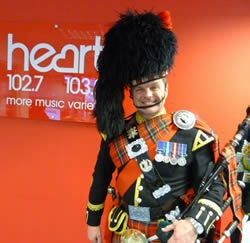 Thanks Cambridge Bagpiper Roy. Once again your piping made for a great atmosphere at our race. It was good to see you being recognised by runners from previous years, a sign of how much they remember and appreciate your playing. 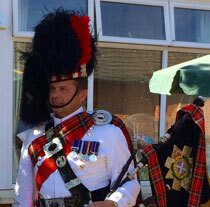 Very many thanks for piping at dad's funeral yesterday. Mum has also asked I pass on her thanks too, it certainly helped to give him a very fitting send off. Plenty of other people commented favourably on your music too - so well done and thank you. I was especially thankful for the way you reacted seamlessly to events and despite us not discussing beforehand, stopped playing at exactly the right momement after the hearse departed. You are clearly a musician of talent and understand the importance of such events; I shall certainly recommend you to anyone who asks. Thanks very much for your services - it was very much appreciated by everyone and certainly gave a lot of dignity to dad's funeral. 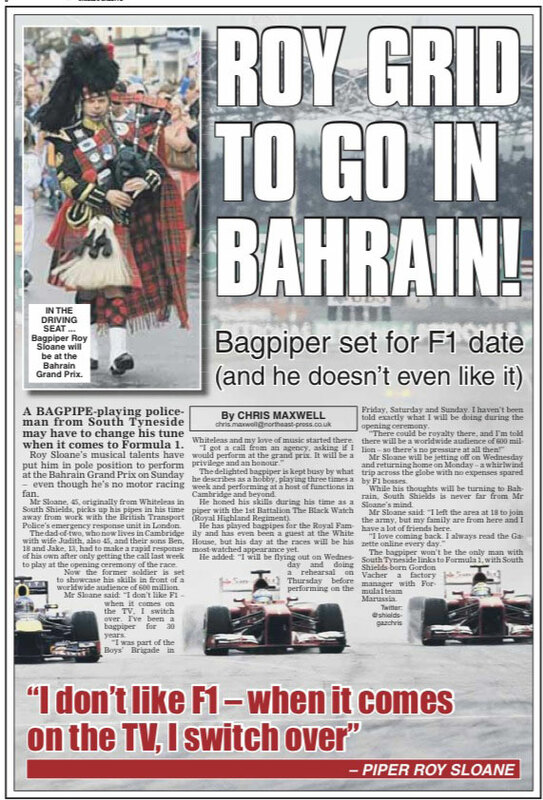 Anyone asking us for a bagpiper will be pointed in your direction! thank you we really enjoyed the music. 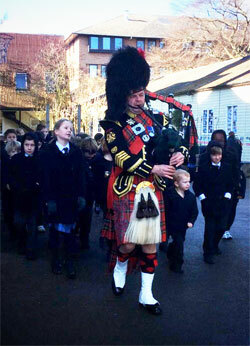 The children loved your uniform, we had some comments from neighbours on how nice the music was. Thanks for last night you were nothing short of excellent. My Mom hasn't stopped talking about it and it made her night, and the rest of the guests thought it was brilliant. Thank you very much. Your playing was the sunshine on a drab terrible day for us all. I had never heard bagpipes in person before and I was amazed!! Thank you so much for yesterday!! I cannot explain how much we all thoroughly enjoyed it. We enjoyed your interaction with us all and learnt a lot of things! We are all still talking about the wonderful experience. It just rounded off a very special day for our special mum. Thank you very very much!! Thank you for coming on Saturday you were fantastic everyone loved you and you completely made the day, unfortunately we didn't get a chance to get a photograph but lots of the guests did which they were delighted with ....thanks again. We're just in and everyone was talking about you. It was fantastic and the happy couple were so so happy. Thanks you so much. I thought you were amazing and would have no hesitation recommending you. 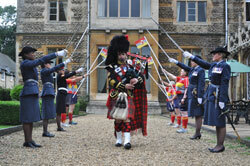 Thanks so much for yesterday, the piping was fantastic and made Bryonys entrance even more special. Proper lump in the back of my throat as you guys come in. Even my brothers who never are emotional said to me your piping and Bryonys entrance really made them well up! So thanks so much again, sorry I did not get a chance to say thank you after the ceremony. 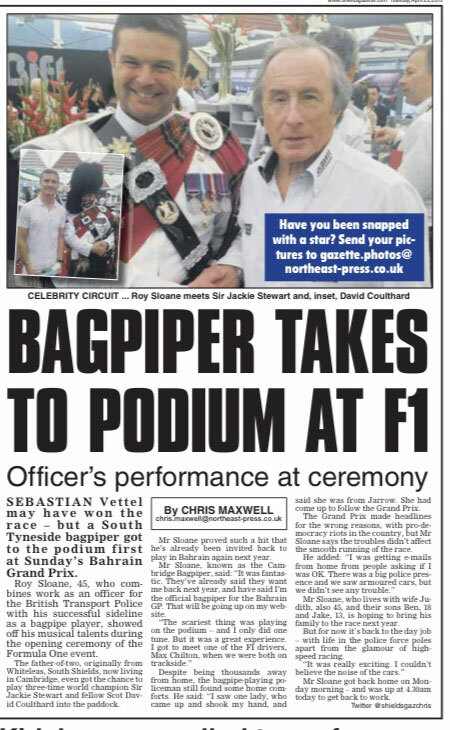 Will certainly put your name forward if anyone wants a bag piper this neck of the woods. Thank you so much for making the wedding of Jon and Claire so memorable. You would not have seen the tears in his eyes when you started to play Claire down the isle. Your friendliness and professionalism could not be faltered and the boys were fascinated when you showed them how to play the pipes. Everyone remarked on how well you played and my daughter wants to book you for when she and her and her husband re take their marriage vows for their 20th anniversary (if you are still playing in 3 years time). Thanks again for such a memorable day. 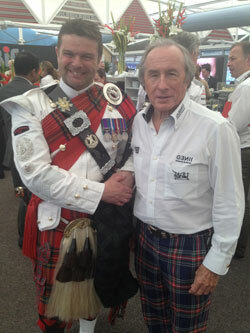 We had an amazing day and the main talking point was you playing the pipes, everyone loved it. You were fantastic and would certainly recommend you. Thank you so much for playing at my fathers memorial service on Tuesday and at such short notice. You were amazing and made the service really special. My dad would have loved it. Top job from yourself on the day, everyone commented on how you added to the atmosphere. You will get the call should we require your services again and I�m happy to recommend you to other interested parties. You were great Roy, thanks for doing it and it was great to meet you, top bloke!! Thank you so very much for coming to play and entertaining everyone! Everyone has said how brilliant you were and that it was the highlight of the wedding! You did an absolutely fantastic job and we all liked hearing about the history and your stories too!! Couldn't have asked for anyone better, you made the night. So thank you very much again!! Mum and Phil were blown away by it all. 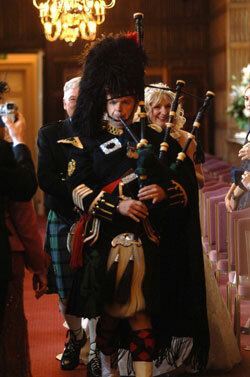 Thanks so much for piping at our wedding. It was amazing and made it very special. It was great, and we had loads of lovely comments about it. Thank you so much you were fantastic we really appreciate it you made our day very special. We will definitely be recommending you to friends and family. 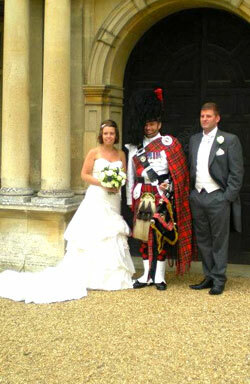 Thank you so much for piping at our wedding. It was fabulous and we have had loads of comments about how great you where. 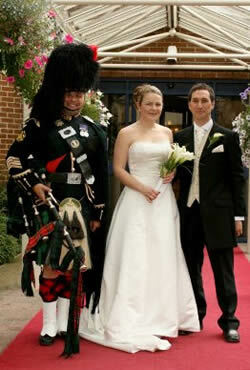 Many thanks again for piping at our wedding. We really appreciated your professionalism and great communication and you staying for pictures afterwards. 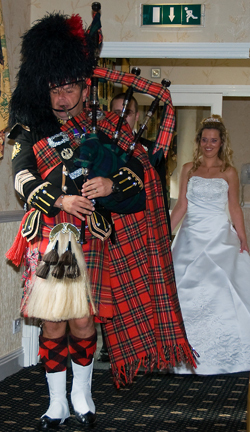 The pipes really made my entrance a great surprise for our guests and it put the finishing touch on a perfect day for us both. Just a wee message to say thank you so much for making our wedding day so special! Your piping was perfect as was your attention to detail, just what we hoped for and more, we had so many great comments from our guests you were a real talking point. Thank you so much for your contribution! It was a wonderful surprise for our friends and family and I think my niece was quite taken by the pipes. 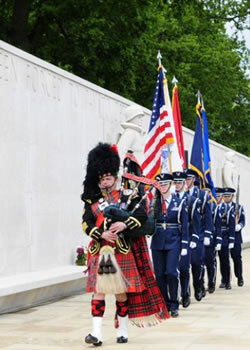 Our guests commented that hearing the pipes made them feel so emotional. When we have the photos I will be sure to share with you. OMG you were the icing on the cake, so to speak. Everyone made comments on how good you were and how friendly and taking time to talk to people. It was a pleasure meeting you and would definitely book you again and recommend you to others. Although no doubt you get booked up quickly. I will keep your number in my contact list. The dress was fascinating and now we know! There was no over payment, we decided that is what we would pay you. It was worth every penny. Mum was so delighted it just made the day so special for her and the guests. Thank you so much for fitting us in to your already busy day. You were brilliant. It was a wonderful send off for my Father. He would have been proud. Thank you once again and good luck. You were brilliant thank you so much, everyone said you made the day...I feel very lucky to have chosen you! All I can think of to say is it was much more than ok...It was also good to meet you in person. Best wishes and thanks from all of us. Thank you so much for today. You made the Burns Lunch so special for all of us. 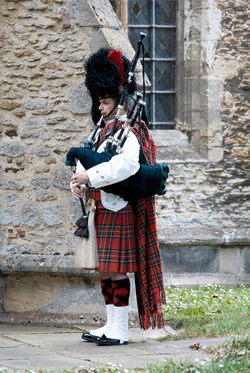 It was wonderful for me to hear the bagpipes, which I sorely miss. Members and helpers alike were hugely enthusiastic with their praise of your playing and your talk. Such a lovely, lovely day, thank you. Here's a lesson in how to play the bagpipes from 'The Cambridge Bagpiper', but it looks like he may have a pair of difficult students on his hands with Kev & Ros! Just wanted you to know how moved everyone was with the Christmas tribute to my mum and father-in-law, there was barely a dry eye in the garden. You made our memorial so special and memorable for everyone, you are a true professional and I will be recommending you to everyone. I just wanted to thank you for the wonderful performance you gave at my husband Ian's funeral at the Fenland Crematorium on Friday 18 October. 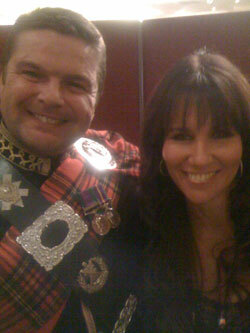 As you know, he was in the Black Watch himself and would really have appreciated it. I wanted to find you after the ceremony to thank you but by the time I had extricated myself from my family and friends you had gone. Thank you so much!! Everyone really enjoyed the pipes! I hope you enjoyed playing at the barn. Great work yesterday. Many thanks. The lads were beside themselves walking behind you from the pub to the venue. They thought it was amazing, as did I. We loved the piping, and were so pleased we asked you. Everyone commented, and it was fabulous to be piped in to dinner. Thank you! Just wanted to drop you a quick email now I'm back to reality and say a massive THANK YOU for playing for us in our big day! The guests all loved it and you really made the day complete. Apologies for the delayed response. We had a great day which was definitely helped by you being there. Many of our guests commented on how great the pipes sounded in the abbey; something they had not experienced before and would not forget. Rest assured I will have no hesitation in recommending you and will look for opportunities to utilise your skills with any future functions Hayley and I organise. Sorry I am late sending this but just wanted to thank you on behalf of me and my husband for playing at Jamie & Toni's wedding on Saturday. He was both shocked and thrilled when they walked out of the church to hear you playing. He was very emotional when he thanked us. You made a special occasion even more memorable for lots of people on that day. I will gladly recommend you to friends and colleagues. Once again a big thank you. Thank you so very much for your excellent performance at Dad's funeral yesterday. He was proud of his scottish roots in Sheddocksley, Aberdeen. 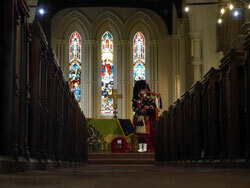 I found the whole service very emotional and your playing the bagpipes really made the service very special. Many Thanks for yesterday, we all had a fab day and the piping was fantastic, many people said it made the hairs on the back of their neck stand up just hearing the pipes. Abbie was desperate to walk to the church and thankfully the rain held off for her and it actually turned into a really lovely sunny warm day. It was made even more special to be escorted by you looking great in your uniform. 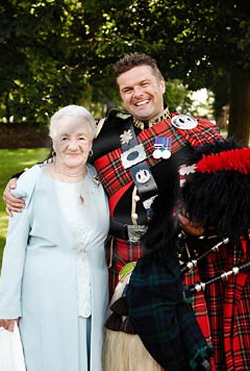 I hired Roy (The Cambridge Bagpiper) for my grandmother's funeral in June 2013. She was born in Dundee in 1922 and was a true Scott through and through, not to mention a fan of the Black Watch (Royal Highland Regiment). She loved the pipes, and Roy gave her a very memorable sendoff. His playing was fantastic not to mention the traditional dress which was outstanding I would recommend Roy for any event he's first class and a true pro. Thanks Roy, Lee Rose, Woodchurch, Kent. Phil here, the groom from Friday. I just wanted to say a huge thank you from both us for being there at Madingley and for piping so brilliantly in the rain. We're just sad that the weather meant we couldn't stick along to hear more of it, but we really really appreciated the time we spent with you. It would have been nice to have had the time to stop for a proper chat too. We've got a few good photos of you we can pass along if you like. 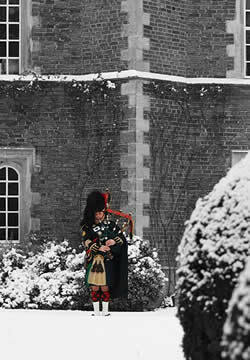 Thank you for a fantastic day on saturday, so many of our guests said how lovely it was to have bagpipes playing. Neal's dad loved them. Our highlight was when you played us into the Wedding breakfast. When we get our photos I will email some over to you. Many thanks again. What you did for us on Friday was beyond my expectations: have you ever heard applause at a funeral ? I haven't! And thanks for playing in the school too - it made their day and will help them remember the occasion in a spectacular way: the donations to the climbing frame fund at the school in memory of my mother have reached over �700, so all in all, it was a good day despite the sadness. I'm looking forward to seeing the pictures my sister in law took with you - I'll forward them if they turn out well. Warble Entertainment were very efficient and easy to use. Roy was very nice and looked absolutely fantastic in his attire. He arrived in plenty of time and was smiling through the whole occasion. His recommendations for tunes to be played at our ceremony were much appreciated as we were at a loss on what to choose ourselves. We would have no hesitation in recommending Roy, the music was wonderful and our photos with him playing in the background were stunning. Our guests were delighted with the suprise. 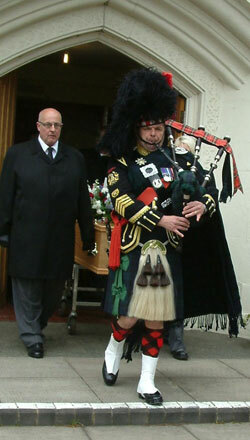 Thank you so much for playing your bagpipes at mum's funeral on Friday. Everyone commented on how wonderful you were. What a fitting tribute it was - Mum would have loved it. Thank you again. Thank you so much,although it was very sad it was also very uplifting,a lot of that was down to you! Did you see the horses when you were playing they were enthralled! 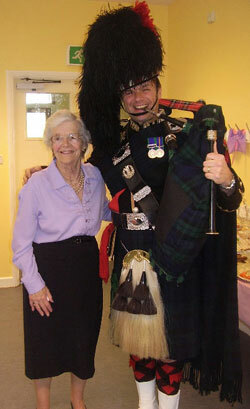 My mum was 90 and was so proud of her Scottish roots! She would have loved it! Thanks again for a spectacular day. It was a fantastic moment when the church doors were flung open and the organ music blended with your pipe music as we all spilled out into the spring sunshine! I think our daughter and her husband will always remember that special moment! We all had a great time and what a surprise for the Groom. Thank you for staying to pipe them back after the long photo session, I would happily recommend you. We were all highly satisfied with your performance, yesterday. Many members of the congregation commented on how professional you were and how much Glenn would have enjoyed it. I will ensure Watkins and Stafford are also aware of how much we appreciated your contribution so that they will feel comfortable in recommending you in the future. It was also a lovely touch for Chris to be able to play your pipes at the end, a generous gesture on your part and the talking point of the wake afterwards, so thank you. 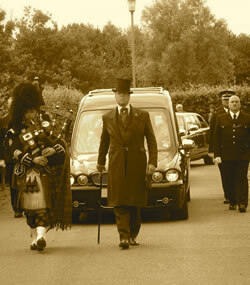 just to say a big thank you again for piping at dads funeral, everyone said it was lovely. 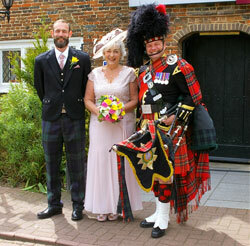 Hope next time we need a piper it will be on a happier occasion. Got your number for future reference, take care. 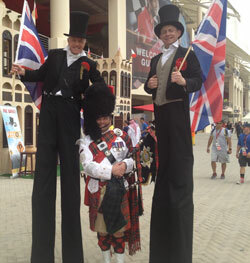 we all thought you were absolutely marvellous and thoroughly enjoyed it- both adults and children alike. 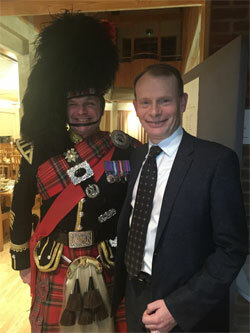 It really brought Scotland and the traditional Scottish dress to life and we all learnt some interesting facts. You fair stirred up the guests from the first note! We girls were tarting ourselves up on the 3rd floor so left door open to hear the music before ceremony. Fair got us in the mood for a party. Thank you for piping me down the aisle..most unexpected but brilliant. 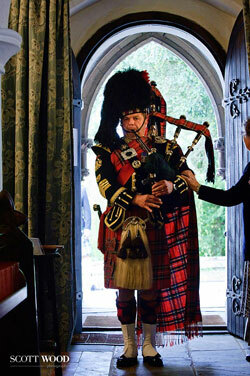 Many a tear was shed as my girl was piped down the aisle to Highland Cathedral. 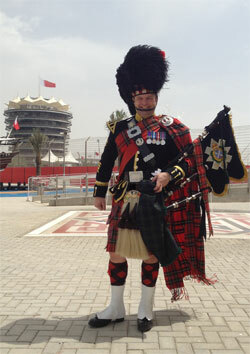 Such a brilliant atmosphere and the English guests loved the pipes and kilts. 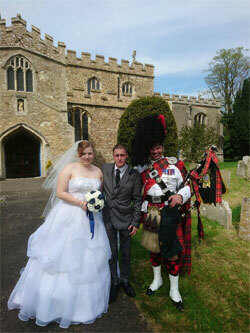 Louise and Tom were utterly thrilled to have you pipe at their wedding. Money well spent! 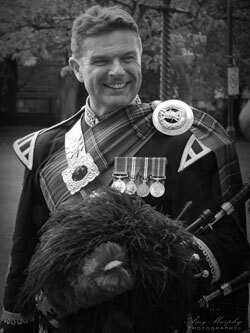 Many thanks for your outstanding contribution - nothing gives these events more authenticity than really excellent piping! Thank you so much for coming to the 1st Higham Ferrers Beavers meeting last night : you were fantastic - it was great for the Beavers to see and hear you and the bagpipes : something they otherwise probably wouldn't get to experience. 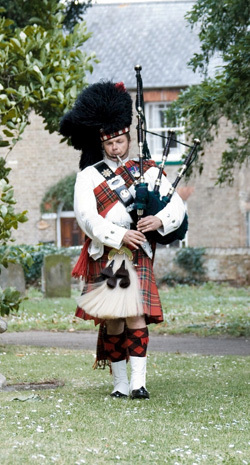 I really appreciated you piping at my mothers funeral today. You sounded and looked brilliant, you really made the day for me. I will definateley be keeping you in mind for all other functions. 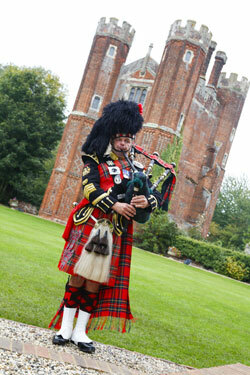 Sorry this is so late but we just wanted to say thank you for piping so beautifully at our wedding in Herts on 8th December. Lots of people commented how they loved the music. Thanks very much for playing at our wedding. We had the most amazing day. It was extremely exciting for me and my bridesmaids when you started playing outside the venue before the ceremony as it felt like the final countdown was beginning! 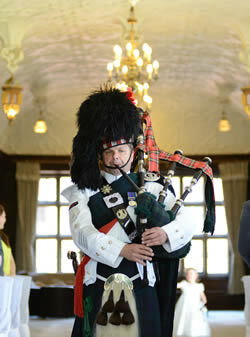 The bagpipes gave the ceremony a real sense of occasion and atmosphere. 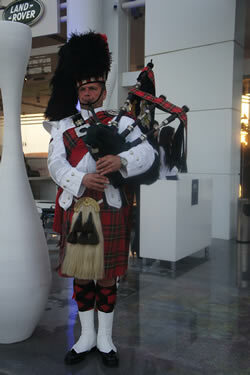 We loved the piping and all our guests commented. Thank you so much, you just made it perfect!! Our new American family just loved you & were still talking about you in the wee small hours. I have a video of you piping, do you want it on Youtube? Thanks again for adding that special touch. Thank you, we really appreciated what you did today for our family today, you played beautifully. I would like to thank you for playing at my Grandfather's funeral on Monday, it was such a lovely touch which was noticed by all of the friends and family who attended. You managed to create a lovely atmosphere on what was a very hard day. 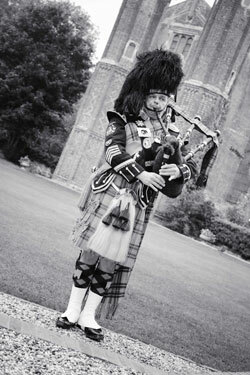 Thank you for piping at our wedding on Saturday it just made it that little bit extra special, and thank you for helping to keep me calm when I was waiting for mum and my other bridesmaids. Darren and I had a fabulous day we couldn't have asked for anything more. 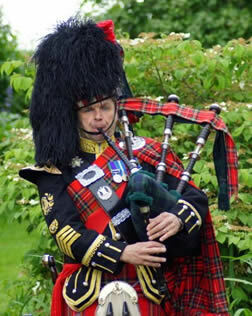 Once again thank you for being our piper. We just wanted to thank you so much for playing at the church on our wedding day. 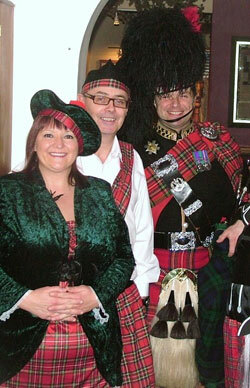 You created a beautiful, Scottish atmosphere which the guests throughly enjoyed. 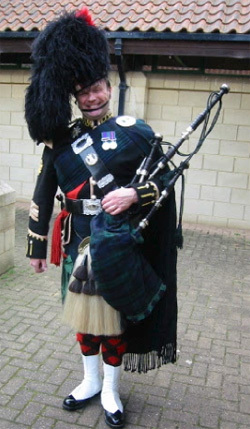 My elderly grandfather who could only attend the church service said that the piper music was his favourite part of the service, so thank you very much. The rest if the day was fantastic, we couldn't believe how lucky we were with the weather! What can I say. You were fantastic. Absolutely made Chelsea's day, and everyones. The vicar also said it was the best wedding she had done at the church. Also the hotel said it was the best they had experienced. Will always remember you and tell the world of you. 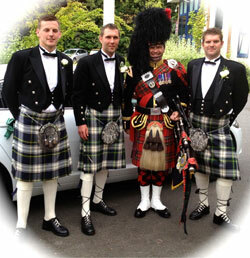 Thank you so much for your fabulous piping on our special day. It certainly got lots of welcome attention and people were talking fondly about it all evening. I just want to thank you for doing such a wonderful job for us on our wedding at Hengrave. You truly captured the feelings of the day and I loved the choice of music we settled on. You also made our dual ceremony and the waiting outside for everyone more resonant and purposeful somehow, if that makes any sense. We both felt so happy that day and you are forever a part of that. Thankyou. i will be happy to send you some proper pictures from the big day eventually - hoping to get them sorted in the next couple of weeks- but since ive been back here in jakarta ten days now I didn't want to go another day without saying thank you to you. Thank you again for your generous flexibility and support, and talent! The day was absolutely wonderful, and everyone had a brilliant time. You were absolutely fantastic and everyone who travelled down from Scotland were very inpressed with you - Thank you so much for making my daughters' day a day to remember. Thanks very much for playing on Saturday. It was a fantasic day and you were terrific. Everybody was talking about you. It probably wasn't the biggest church you've played in !! but it was brilliant. 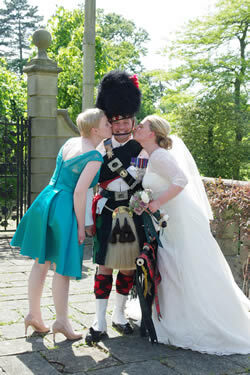 We would like to thank you so much for piping at our wedding; it could not have been better. 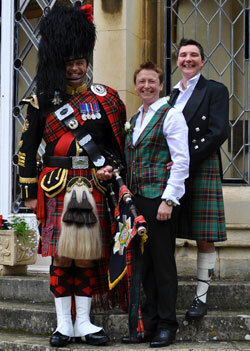 The guests loved being piped in and it made a great atmosphere while the photos were being taken. Everybody commented on how great you looked in your uniform, and taking the time to pose for photos with our guests was much appreciated. You could not have been more friendly and helpful and we can't thank you enough. We would recommend you to anyone and will send you a photo of you with us when we get them. Thank you soooo much for making our special day that little bit more special. You was amazing, all the guest thought you looked very professional and sounded brilliant. Sorry I didn't get to thank you in person was rushed about with photos etc. We will definitely be recommending you to all our friends and family for future events. We had a fantastic day, made all the more special by your presence. We had so many people come to us throughout the day saying how moving the ceremony was, especially the beautiful sounds of your bagpipes. I'd like to thank you for helping make our day so special. I will send you a picture when we get the disc from our photographers. Just to say a huge thank you for doing a wonderful job on Sunday. 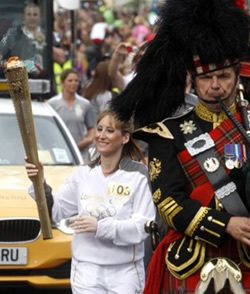 It was a truly magical day and having that little piece of Scotland there just helped to make it extra special. I will send you any photos when they come through incase you want them for your publicity. words fail me as to how talented you are. 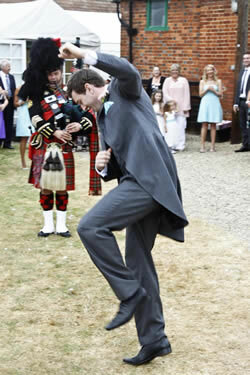 Without a doubt it was my favourite part of the wedding. I have had lots of calls praising you and will be leaving a testimony on your website. Thankyou so much for being part of our wedding. It was a pleasure to meet you yesterday and would just like to say thanks again for opening our country fayre. It was a great afternoon and we had lots of feed back as to how everybody enjoyed our piper. You will be first on my list for any future events, if we recover from this one! You were fantastic! Many thanks everyone is still talking about you! You made the day really special. Thanks so much. 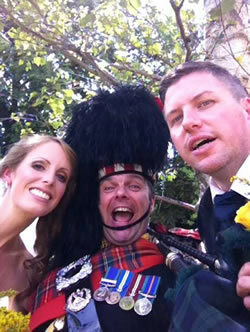 The entire day was amazing, and being piped down the aisle was brilliant. Mr and Mrs Scott Wilson! Thank you Roy for making our ceremony extra special. I know Peter was both surprised and delighted with your presence as indeed were our guests. Thank you for your unique contribution to my husband's funeral on Friday last week. It made a difficult day very special. Just a short note to say a massive "Thank You" for your contribution to my Dad's funeral yesterday. We have had many positive remarks and compliments on the role you played, and we are pleased and privileged to have heard you play. It is no wonder that you have been invited to play at some very grand occasions. Tony has asked me to apologise on his behalf for not seeing you and thanking you afterwards, when things were a bit hectic. We hope that we will have the honour of listening to you play again. Thank You, for coming to Steeple Bumpstead and making out sad day "special" . I'm sure it was quite a picture, with the whole Stevenson family walking up the hill to the cemetery to the sounds of the pipes. I wish that I could have seen it !! I would just like to thank you so much for attending my father's funeral [Carl Jarvis] on Tuesday. You made a huge difference to his send-off that is the talk of the village today. From the time we booked you [which was very short notice] you made everything so easy and relaxed at an otherwise very painful and hectic time, you were extremely professional throughout and managed to play from the church to the cemetery with extreme temperatures freezing your hands. The vicar and funeral director both commented on how good you were. 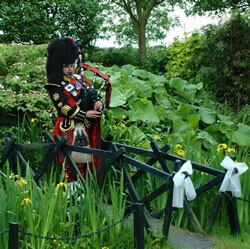 You playing the pipes in the cemetery would have made my father so proud. I am so pleased I found your website, another piper was contacted and a price given but we never heard back from him, good job we didn't as we got the best there is. We will shout your name from the rooftops if anyone needs a piper. Just one thing Roy, get a hand warmer for the winter. Very many thanks from all the Jarvis family for an excellent job. You were fantastic and your ears should have been burning as compliments were flying. You just got it right music and time. Our foreign students loved it. I am sure we will be in touch for next year. Excellent !! We couldnt have asked for anything better and would have no hesitation in recommending Roy for future clients. He helped make it a perfect day. Very smart and polite. The family of the late Arthur (Jock) Compston, wanted me to pass on their thanks to you for such a Brilliant display on the day of the Funeral. Just an email to say a masive thank you for the great job you did on our wedding at Hunton Park on the 24th September. I will definitely recommending you in the future. Just like to say a BIG THANK YOU for Saturday, it was excellent and Ian was overwhelmed with it all. Everybody enjoyed listening to you play and also learning a bit about the bagpipes. Many thanks for such a fantastic performance! You really did make the day! You looked absolutely amazing and I will take great pleasure in spreading the word and recommending you. 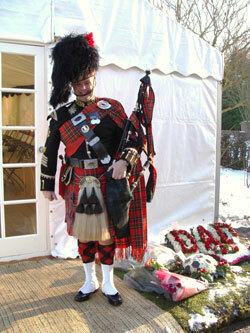 Thank you so much your piping was beautiful dad would have loved it, it was lovely to meet u. 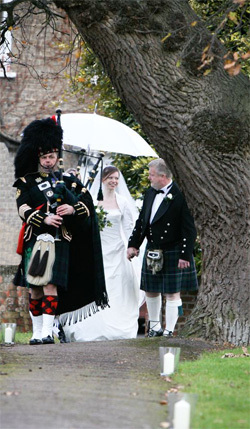 Having lived in Scotland for the past 8 years we wanted a Scottish theme to our wedding day and that had to involve the bagpipes. 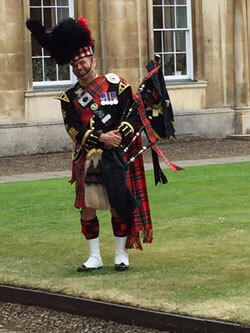 We came across the Cambridge Bagpiper after an internet search. From the off Roy was great. Very amenable to our request for him not to be an active part of the service but to be an active presence in the church yard prior to and after our wedding service. 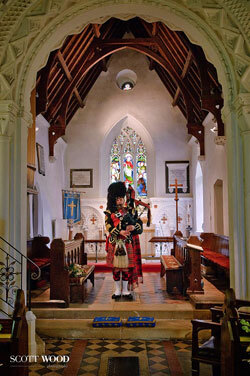 We should in hindsight have asked him play at some point during our service as his piping was utterly superb. 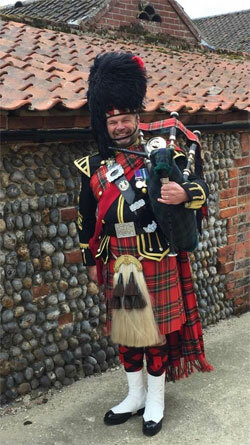 Roy was dressed to impress in full Regimental Outfit and stood proud in the blissful sunlight of St John's Church yard, Stansted on the 16th September. 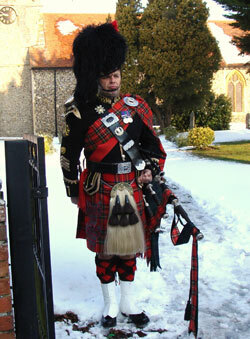 Our guest just had to follow the sound of the bagpipes to arrive at the church. 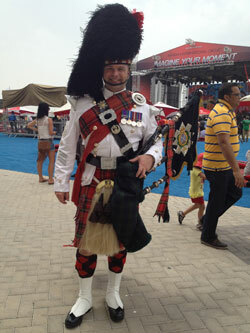 They all commented on how magical the bagpipes were and how much they enjoyed the tunes he played. 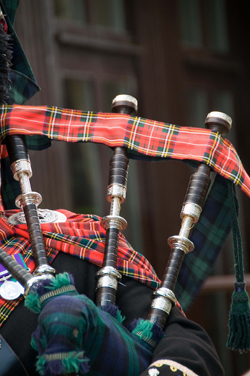 Many had their minds changed about how beautiful bagpipe tunes can be. All in all Roy provides a fantastic service and would highly recommend him to anyone who wants to add a spine-tingling edge to any function, whether it be Scottish themed or not. Roy, thank you for helping make our special day, absolutely amazing. I would just like to say a huge proper thank you for Weds 21st, I couldn�t thank you properly, as I was too emotional, you really did a fantastic job and I know Dad would have been extremely proud.The guests said how powerful it was to have the pipes played andI know they will all be talking about it for a long time to come. Many thanks once again for helping to make our day special. Lot's of praise for you from our guests for your playing and also for the way that you mixed with everyone. Thanks Roy for a wonderful day. 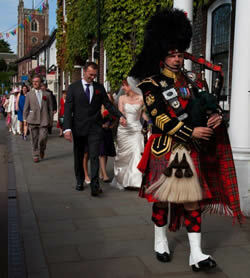 So many people said how special it was to have a piper at the wedding. You looked the part and played amazing. Thanks for making the wedding that extra bit special. Just back from a few days away. 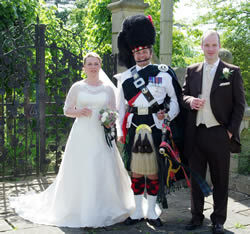 Thank you so much for piping at our wedding, it really was a fantastic day. All our guests enjoyed your playing and I myself was thrilled to have my chosen tunes played so well to go up the path, down the aisle and down the path to. It's a shame as the bride you arrive last as I would have liked to have heard more! 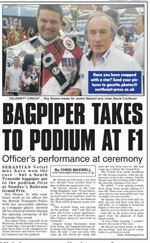 Thank you again; if ever I am asked if I know a good bagpiper I'll be sure to recommend you. Thank you so much for agreeing to pipe for us, you made the day extra special and Claire was over the moon. 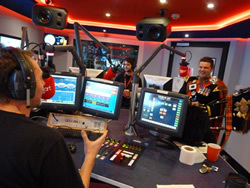 The look on Craigs face were just brilliant, and he loved it. It made it very special for us that you joined in and mingled with guests, everyone said how lovely you were. 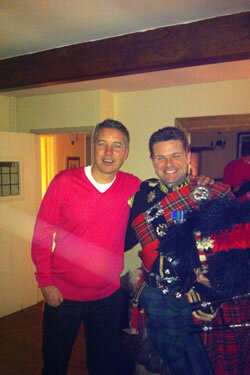 Yes they did manage a couple of notes from the pipes, i don't think you have any competition on your hands though!! I just wanted to thank you once again for playing at my Dad's Funeral last Thursday. From the first time we spoke you have been very professional and easy to deal with. Along with all the guests I was very impressed with both your outfit and of course your playing - a fantastic tribute and send off for Dad. I will certainly recommend you and I am sure we will hire you again in the future. I look forward to meeting you again , hopefully at a happier occasion. Thank you so much for everything you did for us on Saturday you were fantastic and everyone commented on your kindness. Your piping was perfect and gave our wedding an extra special touch. Thank you for your work the other night. As you know we dined out a Lt Col who has served 40 years in the Army and your performances throughout the night added to what was an memorable evening for him. 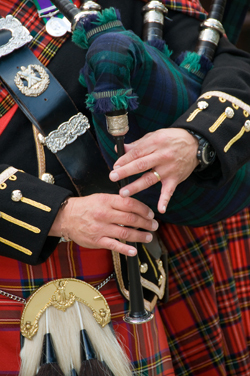 Your musical ability, range and skills as a piper were superb and your turn out and dress impeccable. 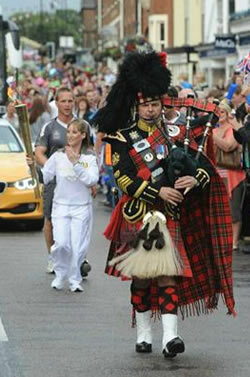 Everyone who commented on the piper was full of plaudits and favour. 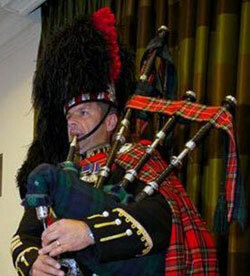 I have no hesitation in recommending you to anyone who requires a quality piper for any occasion. Thank you so much for making the wedding a great success. 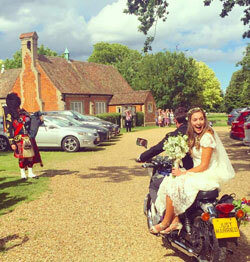 The guests,bride and groom were all so surprised which made it special and something they will all remember. You were absolutely marvellous and your presence, despite bringing a tear to many an eye, made the day perfect. My Dad would have been so chuffed to be honoured in such a way and my Mum was thrilled and moved in equal measure. Dad's passing has been tough on everyone but you made his funeral special so I am so grateful. 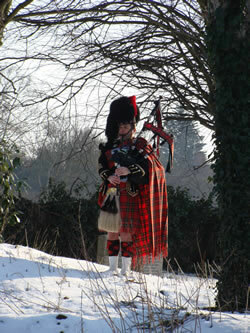 The skirl of the pipes is such an emotive sound and I know everyone loved what you did so thanks. Sorry for the delay in getting back to you we have only just come home. Thank you so much for playing at the wedding it really did make it so special for us and all the guests thought you were fantastic! Thank you so much for coming to play at our wedding. Your piping was wonderful and all the guests commented on it. Aside from your music, you looked wonderful to! My mother appreciated Highland Cathedral. The Reverand was also impressed and mentioned you during the ceremony! Thanks again, and I will definately recommend you to my friends for any future weddings. I thought today was amazing so many thanks to you! - you did us proud but most of all Tommy, he will be smiling down. We would just like to say a massive thank you for playing at Nan's funeral, you made it so special and was extremely moving for everyone. A very sad day but we gave Nan a send off she would have loved especially "Scotland the Brave" at the end. Everyone commented on how fantastic you were, you made it a memorable day. Thank you so much for making my Dad's birthday such a special day, he was just so overcome by your playing, it was the most perfect day, thanks to your relaxed manner. I dont think that myself, my Dad and all the family will ever be able to thank you enough. 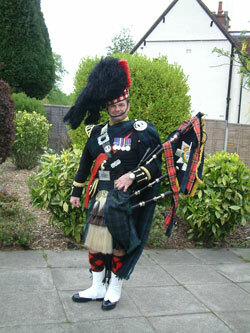 If I ever know of anyone wanting a piper, I will be sure to pass your details on, you were just so perfect. I just wanted to say thank you again for last Wednesday you really made it very special and nearly everyone said such nice things about your playing and the uniform in which you looked so spendid. We have relatives still staying with us as they have been stranded and unable to get home as a result of the cancelled flights so things have been a bit hectic. Wishing you continued success and again many thanks. I would like to send you our thanks for your contribution at the funeral of my dad Peter McDonald, Everybody has commented on how very special it was and that it was a moving tribute to him. Your presence made it very special and the memories will stay in our hearts forever. Thank-you so much. Just wanted to let you know you were brilliant all the guests loved it and Katherine and I are very grateful to you for making our day very special. The party went very well - a great way to celebrate Robert's 50th birthday. 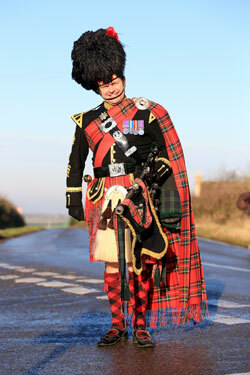 Thanks once again and whenever we need a piper again we shall know who to call. Just to say very many thanks for your splendid turn out and input at Eddie's 60th Birthday. We all thoroughly enjoyed it and I have been asked to let you know what a special treat it was for all the Kelly Scottish family. Thanks from Christine and Myself for your wonderful airs whilst our guests were arriving for there pre dinner drinks, we had nothing but great feedback from all our Lodge members and their guests. And to be piped into to the festive board was absolutely outstanding, we are both still trying to come down to earth. Once again thanks form us both and all the Menbers of Rainham Lodge for getting our Ladies Night off to such a rousing start. My kindest thanks for a job extremely well done on saturday. Your piping really did add such a wonderful degree of theatre and a finishing touch to the military presence at our wedding. Many people commented on your playing and your addition to our photos sets them off a treat. I'll be forwarding a few you can use perhaps in due course. Slainte agus buaidh gu brath! 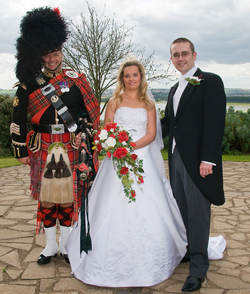 We were delighted with all that you did at the wedding to ensure that it was a very special day indeed. 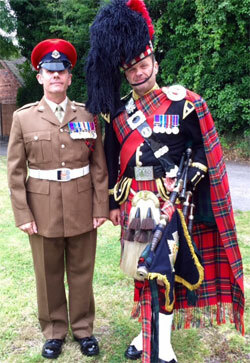 The quality of the music was first rate and the time and trouble that you took to ensure that the organist matched the pipes went beyond the call.Your rendition of Highland Cathedral was superb, played with style and with the expertise of a consumate professional who looked so impressive in 1BW ceremonial uniform. So many of the guests commented on what was universally regarded as a first rate performance. We also much appreciated your good humoured sage advice on the moves to and from the altar. Would just like to say a big thankyou on behalf of my whole family for the role you played in my Dad's birthday celebrations on 5th September. I've never seen my Mum & Dad so (pleasantly) surprised - my Dad is not often rendered speechless! 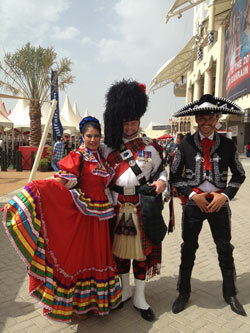 Your piping and traditional dress were terrific. But most of all thankyou for being so friendly and sporting. Your obliging and approachable manner made the day the joyful celebration we hoped it would be. Many thanks again for being such a top bloke! My whole family and friends would like to thank you for making the funeral of my father William so special, it was understandably a difficult day for all who knew William so well, however your presence and the discreet but special way you conducted yourself made the day reflect the character of our William , this will remain with us all. 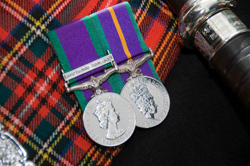 When we considered a piper for his funeral after he served in the Black Watch particurlarly in Korea, it was initially a nice to have, you made it the best decision we made for the day. Thank you so much for helping to make Helen and James' day yesterday. Everyone enjoyed your playing so much (apart from our cats, one of whom legged it for over 24 hours!) - and Marie's Wedding I loved. You were also great at keeping my mum occupied while we were all too busy to talk to her. I shall tell all my friends about you. It was a great start to our evening. Our director was very taken back and well surprised. I was a good touch to have you walk with us from the hotel to St Johns. Many thanks for being so flexible. 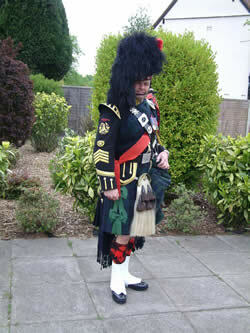 Everyone commented on how good you looked and the quality of your bag piping. Our German colleagues said it was one of the highlights of their visit. Well done and thanks again for everything. I just wanted to take this opportunity to say a massive thank you for playing at our wedding last Saturday. 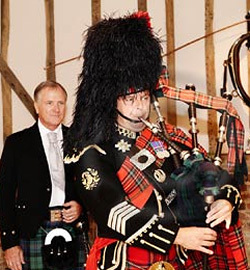 So many of our guests commented on how nice it was to have the tradition of the pipes and also at how perfectly they were played, it really added that something else to a very special day. You were wonderful, thank you so much. 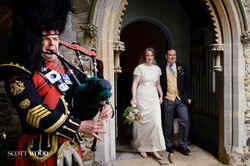 Your dress was very impressive, many people remarked on it and how lovely the music and the piping was. We had some lovely comments about the funeral in general and what it contained for our mother. I am glad you were part of it. I would like to sincerely thank you for your attendance which was appreciated by the family. Your uniform and performance was very professional and good value. A sad day made very special and one to remember. We will have no hesitation in recommending your services. 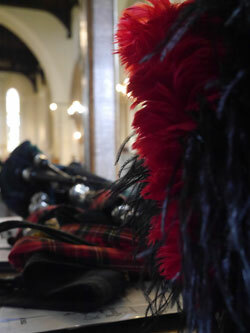 It was wonderful to hear the pipes played so expertly down here in Ufford and everyone really enjoyed them. I heard about the "reluctant bride" and I wish I had been there to see it. I can't imagine what all the fuss was about! You should have given her an order. The whole day had a magical quality and the piping certainly set the tone. Many thanks and I hope our paths cross again. Thanks again for playing for us. Gemma (who hosted the party) and all of the guests really enjoyed it, and all agreed that it really added something special to Burns Night! Just to thank you for the music you provided today at my Fathers funeral.today All the people attending thought it added a poignant touch to what was a sad occasion. The Scots who attended were impressed which says it all ......!! Sorry for taking so long to tell you how much we enjoyed your performance at our wedding. You were excellent and everyone had a great time watching and listening to you. Next time we are in Cambridge we will have to sink a few together. Our biggest thanks goes to you for playing such lovely music. I've had non stop great responses from everyone at the service and hotel about you. You were amazing, thank you. I would have no hesitation in choosing you again should I need a bagpiper for any occasion, you were worth every penny. I just wanted to send thanks to you from both of us as I never got to see you before you went. 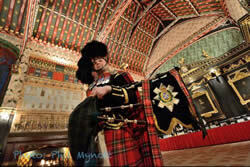 You were fantastic, the pipes are lovely and bring out all emotions and goose bumps across the skin (I particularly liked Scotland The Brave when you piped us into the Wedding Breakfast) ..........you did all of that and more with looking at some of the photos coming in from friends. Everybody, without exception, said you were a lovely person and how well you played. Many thanks for playing at Dad's (Norman Jackson) service at the Crem yesterday. 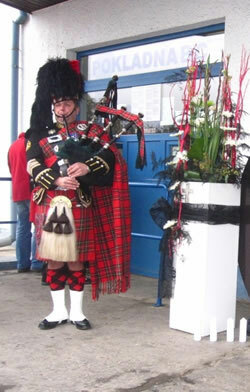 Everybody said it was lovely to hear the bagpipes and it made it a very special day. Just like to say thanks again for the brill job you did on Wednesday at our Dads funeral, so many members of our family were very impressed and thought that you played very well. Although both my husband and i thanked you personally we would again like to thank you. Giving him the Scottish send off that he deserved he would have loved every moment of that. Many thanks for the night. Everybody really enjoyed hearing and seeing the pipes and you got the evening off to a flying start. It was a great success. Hopefully you will be available next year. Cannot thank you enough for the time you spent here at Baird Lodge on Burns afternoon. The tenants are still talking about it now and many of our older ladies had smiles on their faces for day�s remarking on "what a good looking boy you were"! I hope you have been able to book us in for next year as it was a great success. We want to thank you you were spot on and really helped to make the day special. My Mum would have been in tears but would have loved it. Thank you very much for playing at our wedding. We had a really great day and you added that extra special touch that was needed. I am sorry I did not get to thank you in person as you quietly left whilst we were finishing having our photos done. Everybody especially my parents commented on how professional you were and how you just did what you needed and left without any fuss at all. Your contribution to the day was brilliant. I would like to express my thanks to you on behalf of Langtoft & District Branch Royal British Legion and myself personally for the contribution you made to the Remembrance Day Parade at Market Deeping. All the leaders of the various organisations who took part in the parade and service have stated how much they enjoyed it and in particular the Piper. Thanks for making Bharat and my day perfect and everyone thought you played fantastic!!! we had a great day and it was a shame you had to leave! Thank you very much. We had an amazing day and our guests thought it was wonderful that you were there. The Scottish fraternity were particularly impressesd!! It sounded fantastic from where we were getting ready upstairs. Just a quick email to say thank you so much for today. My grandad would've been so proud. Its just such a shame that he wasn't able to be there in person. Many people said that it was a lovely service, but your presence made it something else. It was perfect. The whole family were so impressed by you. We really cannot thank you enough for making Grandads day so special. Thank you so much for everything, you made our day so special. You created an amazing atmosphere and everyone had something nice to say about you. Couldn't have asked for a better Piper!!! We just wanted to say a huge thank you for helping to make our wedding day really special. You did a fantastic job of keeping us and our guests entertained, and we are eternally grateful. We will have no problem in recommending you to all our family and friends. You were truely fantastic! Just a quick text to thankyou so so much for making my wedding special I was very nervous more so than I thought I would be and very emotional with Dad not being there. Anyway wish I could have spoken to you more, hope to see you again in future for future partys not wedding hopefully lol thanks once again you were fantastic. I just wanted to express my sincere gratitude for the marvellous and moving way you played at my fathers funeral today. I could not have asked for a better musical tribute to dad. I also know how much it meant to all of the friends and family that knew and loved him so well. I hope I have the pleasure of hearing your pipes in happier times. with grateful thanks, Mike Payne. Very competitive rates, I aim to beat any quote you have been given. a non-refundable deposit will be taken. 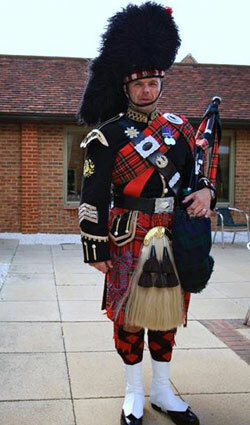 © Cambridge Bagpiper 2006 - 2011. All rights reserved.